Until the invention of the smart thermostat, you probably only really thought about your thermostat when engaged in a battle of hotter/colder with the other inhabitants of your home, who clearly don’t care about bills/comfort. Now, thanks to connected thermostats you can control different rooms independently, ensuring that everyone gets a temperature they’re comfortable with, and that the bill-payer gets to save some pennies because only the rooms that are being used get heated. 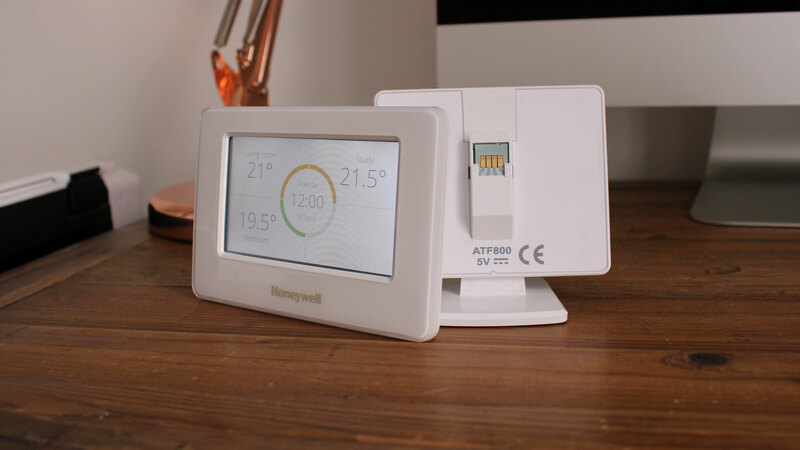 One such thermostat is the Honeywell Evohome. At the time of writing, this thermostat is already a few years old, but is considered one of the best in the industry on account of its zonal controls, easy installation, and user-friendly interface. But the question is, now that there are younger, swankier models ram-packed with features on the market, can this simple, solid solution keep up? 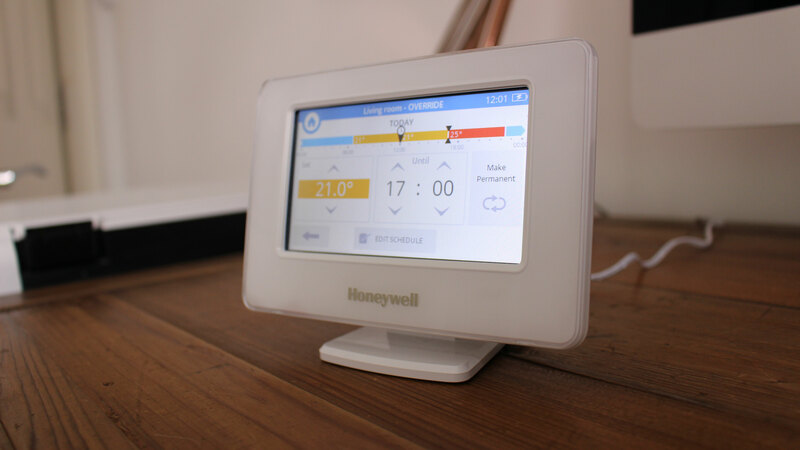 The Honeywell Evohome is available in the UK, US and Australia. As it&apos;s a UK company the prices for other regions can depend on the supplier so we&apos;ll be providing approximate rates here. Pricing is a little complicated (and not cheap) due to the modular nature of the kit. The control panel will set you back £229.99 (about $330, AU$220) not including installation, which in the UK will cost about £100. On top of this you&apos;ll need a valve for each radiator. These will cost £59 (about $85, AU$100) if bought individually, or there are packs where you can buy a larger number at a discounted rate. It&apos;s definitely worth looking for a pack that best suits your needs. Installation of the Evohome system is a little more involved than with some other smart thermostats available due to the fact that each radiator in your house needs to be fitted with an individual thermostat. This means you’ll need radiators with TRV valves to start with, or be prepared to stump up the money to change your current valves to TRV valves. TRV valves are the type that enable you to adjust the temperature of the radiator. 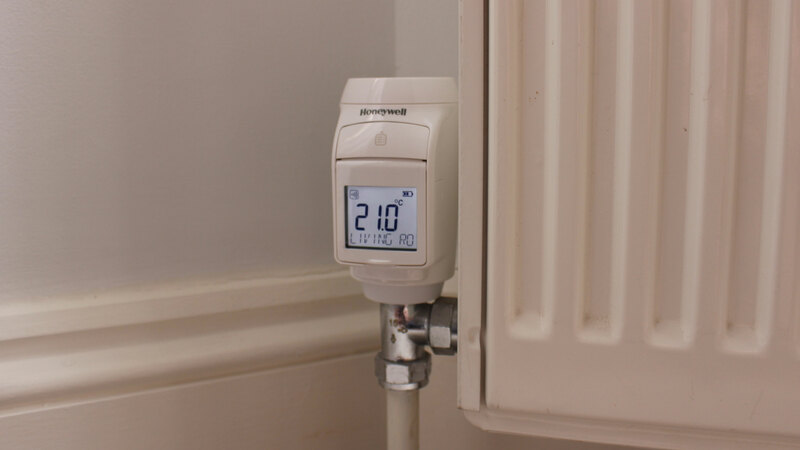 Most modern central heating systems will have TRV valves, but bathroom radiators often don’t. This was the case in our house, and we were told by the installer that what would happen was that the bathroom radiator would simply turn on any time one of the other radiators was on, which we figured wasn’t too big a problem. If you don’t need to change valves, the installation of the individual thermostats is unbelievably easy. The TRV valves just pop off and the Evohome valves slide on. The installer even shows you how to do it yourself so that you can change the battery on the thermostat when it eventually runs out. The main control panel just needs to plug into a wall socket and then connect to your Wi-Fi network, so can go anywhere you’d like it. It can be used as a temperature sensor or simply as a control panel. Pairing the thermostats and the control panel was also very simple – the entire installation took about half an hour for a two-bedroom apartment. The only bit of the installation that was a bit tricky was the rewiring needed to connect the boiler to the wireless signal receiver. This makes your previous thermostat redundant, so you’re left with the option of having a redundant thermostat sitting on your wall, or getting it removed and repairing the resulting hole. This isn’t technically part of the installation, but it’s worth remembering when calculating the cost, as you don’t have this issue with a direct thermostat replacement like the Nest Learning Thermostat. All of the individual components of the Evohome setup are made of the same white plastic, which is disappointing when some of the competition have clearly put a lot of thought into their designs. It’s not that the design is unpleasant; it’s just clearly been designed to be functional rather than fashionable. It does mean that it’ll probably be able to fit in with a wide range of interior design styles, but for our taste the range could do with a bit of an image upgrade. The main control terminal sits on a white dock that’s also a charging platform. That’s right, the terminal has a battery on board so that you can move around the house while setting temperatures. You need to make sure you return it to the dock though, as the battery life isn’t long enough to leave it off the dock overnight, and it’s the unit keeping your entire heating system running. The terminal houses a backlit resistive touchscreen that allows you full control of the heating system. We’ll get into the full spectrum of the features a little later on. One gripe we had was that the screen is always on; it has an ‘idle screen’ that you can set to display either a digital or traditional clock face, with the option to show current settings, but there’s no option for turning the screen off entirely, which forced us to move the terminal to the study as the constant white light was an annoyance. 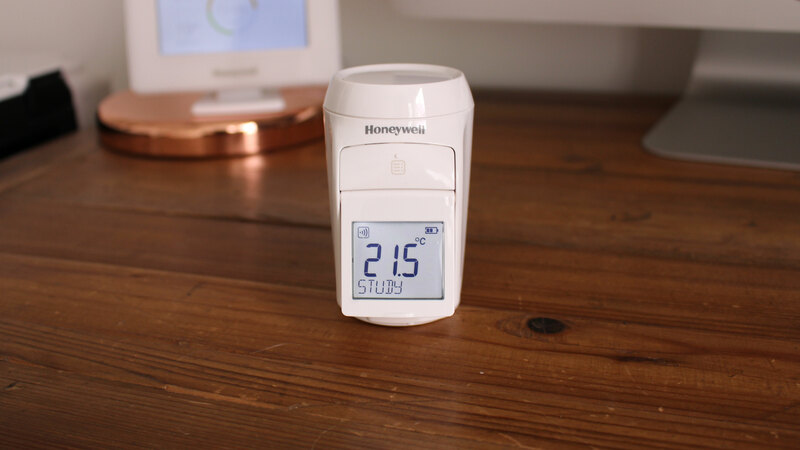 The individual thermostats come with their own screens that are adjustable, so they can point up towards you, saving you from having to crouch down every time you want to see what the temperature is currently set to. There is a twist-dial on the thermostats, so you can override the current settings from the radiator without having to use the control terminal or your phone. You won’t get as sophisticated a level of control, but to bump the temperature up or down a couple of degrees it’s perfect. In contrast to the hardware, the app is beautifully designed. It’s very clearly laid out, with color coding for temperatures allowing you to identify at a glance the temperature for each room of your house. 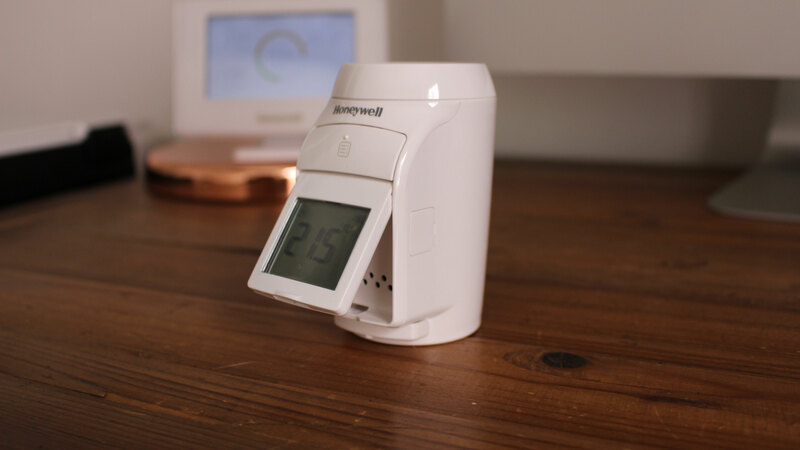 The Honeywell Evohome allows you to set schedules for each individual thermostat, so if you know that your bedroom is only used at night, you can set it to be cold during the day, heat up half an hour before you head to bed, and then cool down to your preferred sleeping temperature through the night. The Evohome can even work out how long it takes to heat a room to a particular temperature, and turn on the radiator the appropriate amount of time before a scheduled window so the room is exactly the right temperature when you walk through the door. Having zonal controls means you can have totally independent schedules for each room, so people using different rooms can have the heating set to their specific demands. This was something of a revelation when we got it to work. The apartment we were testing the Evohome in is one of those properties where every room is a different temperature, and what this means is that we always heat to the right level for the living room, but then go through to a cold bedroom. Not so with the Evohome – it was the first time since we moved in that the bedroom had been warmer than the living room. And figuring out the temperatures that different rooms needed to be at to feel comfortable was something of an issue for the first few days. It’s definitely a more labor-intensive process to figure out the heating requirements of each room and the schedules, and we didn’t get it right for the first few days, leading to some cold evenings and hot nights. While it is possible to just put your entire home at the same level constantly, that would be like doing the school run in a Porsche. You get Evohome to get unprecedented control – just be prepared to spend some time and effort exercising that control. Once you’ve set up a schedule, it’s really easy to customize, override for short periods, even activate special settings. So if you’re up late you can do a custom override, or if you’re off sick a single button will activate ‘day off’ mode, which uses your schedule for Saturday on a weekday. If you’re still wanting to save the pennies there’s an ‘economy’ mode that reduces all temperatures across the board by a few degrees, and if you’re off on holiday a simple push of a button turns all the heating down to 15 degrees. Of course, one of the biggest draws of a smart heating setup is the ability to do all this from your phone, and the Evohome delivers in this department brilliantly. The app is so simple, it makes competitors like Tado look positively labyrinthine. All of the features are easily accessible and temperature control is totally natural, effected by either tapping up or down arrows or by holding and sliding to a preferred temperature. This simplicity runs through the entire Honeywell Evohome product. You truly get the feeling that anyone of any level of tech competency could pick it up, and that’s rare in the smart home market. If you’re a serious smart home enthusiast you may find that the Evohome is slightly lacking in the smarts compared to some other thermostats on the market. It works with Amazon’s Alexa voice assistant, but only with Alexa and only in limited capacity. There’s a workaround using the free application IFTTT if you’ve got a Google Home smart speaker, but no integration with Apple HomeKit, Apple&apos;s smart home management software, and none coming either. This is disappointing, especially as there are other smart thermostats from Honeywell, like the Lyric, that have all these integrations (but don’t have the zonal control of the Evohome). Hopefully there will be an Evohome 2 at some point down the line that combines the best of both. The Evohome also doesn’t offer the more advanced features that we’re a fan of in other smart thermostats, like motion sensor-activated routines, geolocation-activated routines (turning your heating on if it registers, via your phone, that you’re on your way home), or learning routines and self-adjusting based on your routine to optimize your heating. One of the major draws of Evohome is that it can control not only radiators, but, with additional kit, hot water and underfloor heating. Our installer found it hilarious that our flat was so small we only needed to have three radiators hooked up – the Evohome is designed for big houses with complex heating and hot water systems. The layout of our flat has proved an interesting challenge for this smart thermostat, as there isn’t a radiator in the hallway or kitchen. Our old thermostat was in the hallway, so the house would always heat to the point where the hallway was warm from all angles. Evohome’s zonal control has meant that the hallway has become neglected in the temperature department, and now we have to close all our doors in order to get rooms to stay the right temperature. Another thing worth mentioning is that the thermometers aren’t entirely accurate. Depending on the size of the room you may get different actual temperature for the same temperature reading. This isn’t a massive problem, it just means you have to take each temperature measurement with a pinch of salt and adjust each room accordingly. 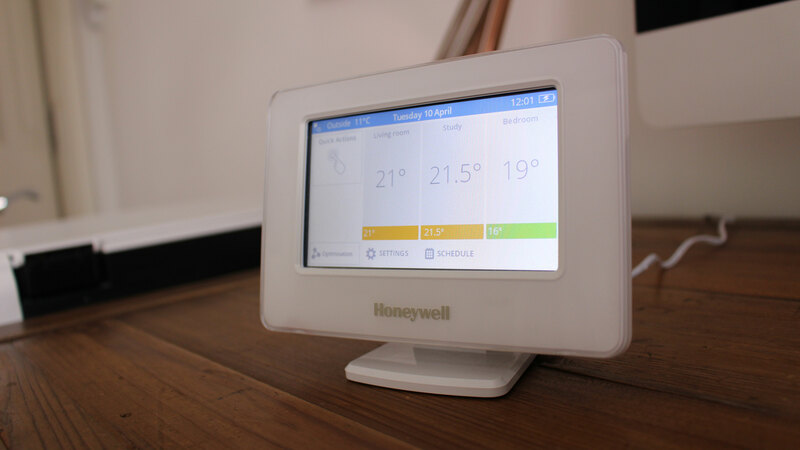 We were blown away by how simple the Honeywell Evohome was to set up and use. The app is brilliantly designed, and all of the features are genuinely useful. It doesn’t feel like there’s anything superfluous about the kit or the app. Once you’ve got zonal control of the temperature in your home, you do wonder how you lived without it. Being able to have towels warming in the bathroom for your morning shower while keeping the bedroom cool until you wake up, and then having that room come up to temperature by the time you step out of the shower, is truly amazing. You can control the temperature directly from the radiator thermostat, from the control terminal, from your phone, and even using your voice by asking Alexa. It’s truly remarkable how simple it is for something so versatile and useful. The design definitely leaves something to be desired, and if you’re hoping for the slick brushed metal smart home look, keep looking. Actually, if you’re a smart home enthusiast, probably best to keep looking. It doesn’t have many of the ‘smart’ features that you’d expect from a smart thermostat like motion sensor control and geolocation. It doesn’t adapt or learn based on your routines, and isn’t capable of working with HomeKit or Google Assistant without an IFTTT workaround. If you’re the sort of household that leaves all the doors open, you’re going to have a problem with temperature bleed between rooms, a particular problem if you’ve rooms or corridors without radiators. Also, as each of the radiators is individually controlled, there is a small motor that makes a whirring noise when changing temperature. It wasn’t an issue for us, but for those that are very sensitive to noise, it’s worth considering. The Honeywell Evohome is an interesting device. In so many ways it’s been left behind by its recent competitors, but it’s still the best we’ve seen in terms of simple, effective zonal control. It isn’t perfect by any means, and really we wish that Honeywell had amalgamated the Evohome and the Lyric into one device so you got slick smart home tech and industry leading zonal control. One thing that really sets the Evohome apart is how user-friendly it is. It’s a smart home thermostat for people who don’t like new and complicated technology – and that’s not us, yet we were still very impressed, which is saying something. 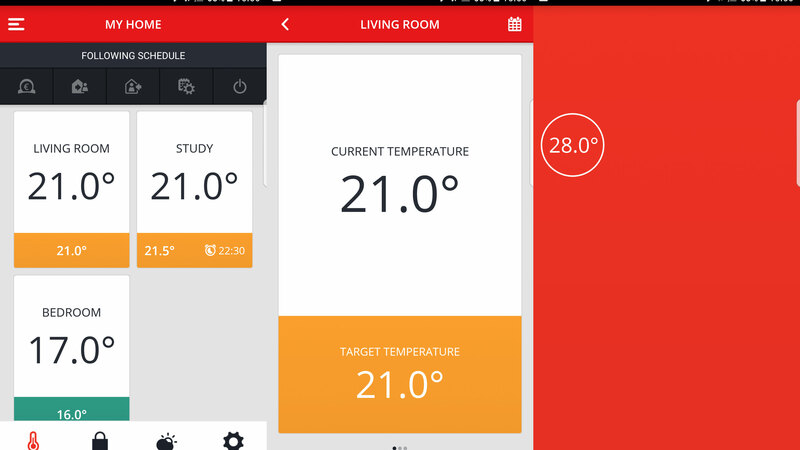 The Honeywell Evohome delivers brilliantly on its gambit: making zonal temperature control child’s play. If all you’re looking for is a system that allows you total control over the temperature of your house, even when you’re not there, get this one. It’s so easy to use and set up, the app is brilliant, and we’ve only had one issue with the wireless connectivity the entire time we’ve been using it (as a side note, our Evohome emailed us to tell us the about the issue and reassure us that it had already been reported). That said, if you want cutting edge smart thermostat features like AI-powered scheduling and geofencing, you’re better off trying something like the Nest learning thermostat, Hive thermostat, or if zonal control is important to you, Tado. Got your thermostat sorted? Now get the best security camera.